Though Techrep’s line card (including Sennheiser, Genelec, and Switchcraft, among others) varies somewhat by region, and is deeper where they are already well established, the company will initially represent QSC and Universal Audio in Florida, along with products they distribute like the JoeCo BlackBox recorder. Mac and partner/CEO Ted Bahas, both of whom are active in the field, founded Techrep in 2000 with a unique approach to marketing their clients’ products. “We run the rep firm like an event company,” Bahas said. Techrep typically arrives at a dealer for product demonstrations or product training with a self-contained, turnkey presentation system, incorporating elements from the various products in their lines. SHERMAN OAKS, CA—Stiernberg Consulting’s newest white paper, “The Tactics of Strategic Planning,” is available free of charge to industry colleagues and friends. This white paper examines the myths and current realities about strategic planning and includes five key applications for scenario planning. 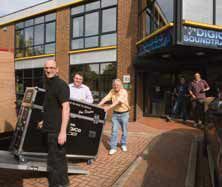 CHESSINGTON, SURREY, U.K.—Launched at PLASA2009 and the winner drawn at PLASA2010, DiGiCo’s 500th SD8 console competition in aid of the families of John Roden and Jim Douglas, attracted entries from across the globe. The lucky winner is from DiGiCo’s home turf: Matthew Cotton (left) from Southampton, collected his oneof- a-kind SD8 from the DiGiCo offices in September with (l-r) James Gordon, John Stadius, Dave Bigg, and Dan Page looking on. The competition raised in excess of £30,000 in total, which will be divided equally between John and Jim’s families.